There may be nothing more exciting for business owners than seeing their new construction project taking shape. One of the best ways for our clients to see a comprehensive view of their construction progress is from the sky. HiFive took to the skies last month to get bird’s-eye images for several current construction projects. In West Chester, things are moving forward at a rapid pace for the Centre Park Holiday Inn Event & Banquet Center. You can clearly see all major areas of the property, including the wedding chapel on the far end. 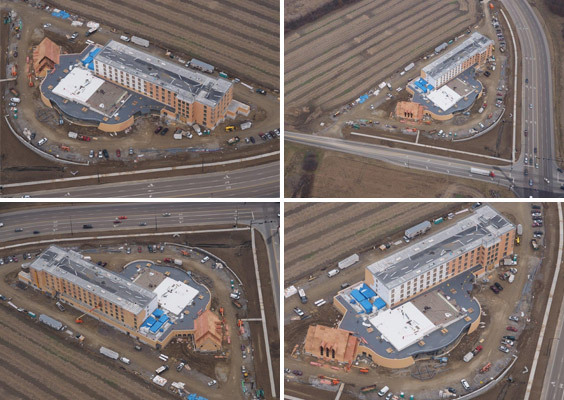 In Columbus, the Fairfield Inn & Suites is nearing completion. The project utilizes trend-setting construction techniques like Zip-Wall sheathing to increase efficiency, saving both time and money for the developer. 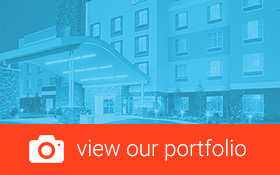 A hotel that opens sooner can start profiting sooner. In Dayton, HiFive’s forward-thinking architectural designs at the Christian Life Center are really taking shape. In nearby Xenia, 4 Paws for Ability is anxiously awaiting the completion of their major addition and renovations. This new space will allow 4 Paws to provide more service dogs to more needy families around the world. HiFive is proud to be a part of all of these great projects. Each project is on target to be delivered on-time and on-budget.